Our mini-break / adventure holiday! I’m slowly learning that South Africans have some very different ways of life than other people do, especially Australians. To a South African (woman), celebrating an anniversary (prior to marriage) is important. An Australian (man) does not see the relevance of this until you are married. So, when I want to go away to celebrate our anniversary, the whole anniversary part of it is slightly down-played and we just happen to do something over that *special* weekend. Last year’s anniversary (the first one) was a simple cheese fondue at home with a bottle of Champagne. But this year I wanted to do something more extravagant, and so we booked a 3 night stay at Qasr al Sarab, and took along with us a bottle of Champagne. Having just bought my car (“Sayara”) I was quite eager to take it for a little drive and open it up a bit on the long, straight (and not many speed cameras) roads. My car loved the drive! Just cruising along with not a care in the world. 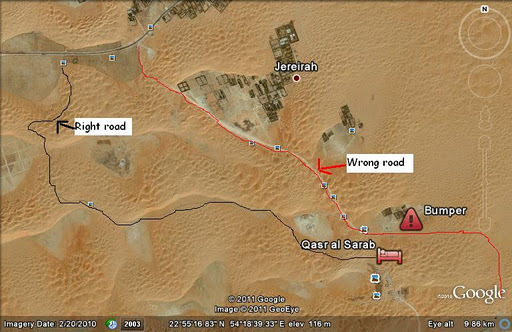 And then we took a wrong turn! Set in Hazel-panic-mode. Luckily Murray kept his cool and did a great job of trying to keep me calm. We started to call the resort to come and fetch us when a 4 x 4 drove past and stopped to help us. About 30 minutes later, a tow rope and minus a bumper, we were free! We very quickly turned around and headed back to the right road and got to the resort a little more stressed than required. We left the car and went to check in. The first thing we did when walking into our villa was open the bar fridge and enjoy a beer, and we then started to relax a bit. By the end of the weekend after much relaxation, plenty sun and great food did we manage to have a bit of a laugh about the whole thing. The resort was absolutely fantastic with the most amazing sunsets over the sand dunes, and of course having our little plunge pool face right into the sunset was a real treat. The anniversary evening was really superb with our bottle of champagne in an ice bucket, watching the sunset from our plunge pool. The entire weekend we treated ourselves to wonderful food and some fabulous bottles of wine at dinner. Sunday morning arrived and we were both a little nervous about what the car was really going to be like so Murray went to look at it while I went to pack up and when I got to reception he said that it looks good to go, but we’ll take it easy on the way home just so that we don’t over exert the engine. When we’d got back into Dubai we called the service centre where the car went for its’ last service and asked if we could bring it past for them to have a look and quote, and we then went and dropped the poor baby off at hospital. I should have it back by the end of the week or so. 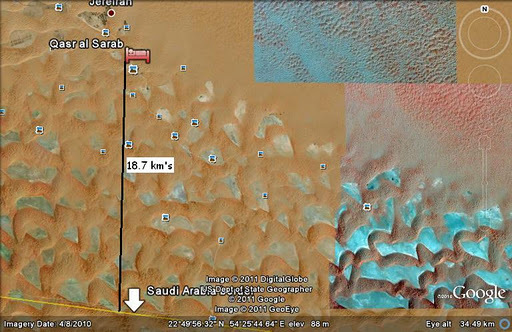 Our resort was approximately 18.7km’s from the Saudi border (to the West). Just a few hundred sand dunes in the way!